Hei, oikein mukavaa sunnuntaipäivä! Tervetuloa heinäkuun Penny Black and More haasteen pariin. Tässä kuussa kaivetaan esiin miehiset leimasimet, sillä pääosassa ovat "pojat". Mallikorttini on valkopohjainen ja kerroksellinen, purjehtijana kissa. 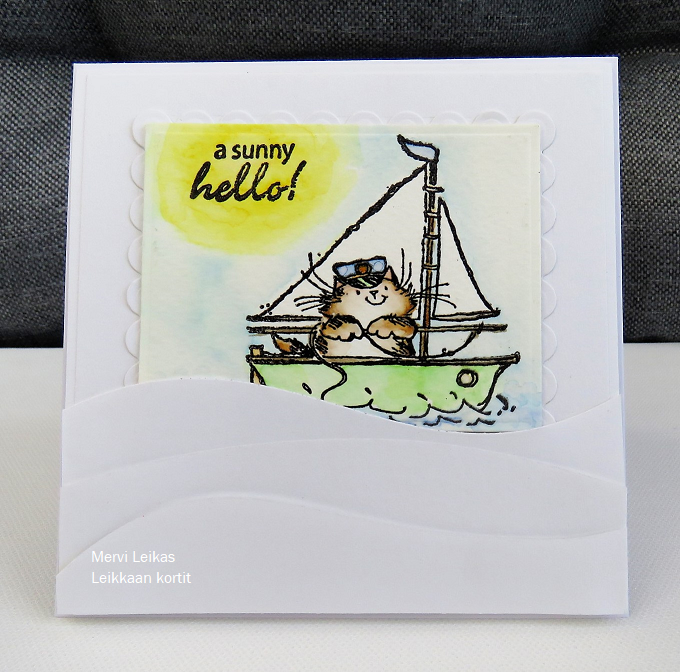 Hello, first Sunday of the month - it's time for new Penny Black and More July Challenge. Our theme is "For the Boys" and remember to use real stamp! Our sponsors are Penny Black, Marianne Design, Stamp Addicts. Die cuts: waves IO and frames Spellbinders. What a great design Mervi and looks like you have taken your photo of the PB sailing cat by the lake, all go together perfectly. 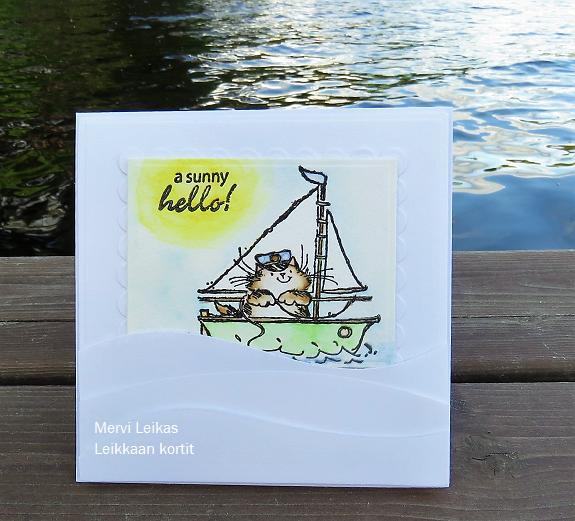 What a fun card Mervi, I may need to get this cute stamp! Hauskasti kerroksellinen ja valoisa kortti kesän riemuista! oh, this is to cute mervi! captain hedgie in his sailboat and the sentiment is perfect. What a fabulous card...love the clean, beautiful lines!! Thank you for sharing with us at Fussy and Fancy "Dies and Punches"...good luck! Oh my he is a cutie, look at the smile ! such a lovely card. Oh, I do like this masculine design, simple in design with lots of white and the perfect detailing to go with it! What a great layout you created for this image - such fun. love it. Great card and that image is just too cute! 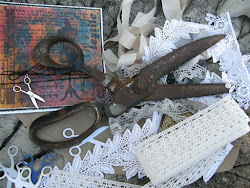 Thank you so much for entering the Crafty Calendar (Anything Goes) challenge this month, lots of luck to you.